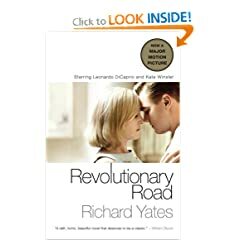 I've just finished Richard Yates's book " Revolutionary road". I rearly write about books on my blog, not because I don't have anything to say about them or because I don't read, on the contrary. I am actually an avid reader, one that thinks each and every spare minute should be focused on learning something new, and what better way of learning than reading? If I have 5 minutes in the car before picking up my son from school, this is 5 WHOLE minutes time, total immersion in the beauty of the imagination, knowledge and wisdom. Nothing else can ever replace for me the feeling that reading of a book gives me. Why haven't I discussed this on my blog then, you would ask ( or not, but I'll answer anyway) ? I have a simple explanation or at least one that makes it quite obvious for me. The book and I, this is like a private relationship, a slow and intimate dance, or like a meek, yet passionate affair, that makes you more alive and breathing, but you can't quite discuss it with others. It's not that you are being ashamed of it. Is more of a jealousy kind of thing. You don't want to share your private emotions. It's that simple. I don't know what is it about it. It's just something that waits to burst out of me like an alien. I am sceptical about movies based on a book, but I'll see this one. Even if it disappoints me. Even if it doesn't remotely reflect my feelings. What more corny than 2 people's private drama exposed in so many pages, for everybody to read? Nothing new to say, nothing new to show. A painful reminder of the reality many of us live in. Same words, same mistakes, same perfect little hell of a life. Isn't it enough that we live it? Do we have to read about it? Yes!!! My goodness, a 1000 times yes! We do have to read about it! To let ourselves see it, feel it and most importantly to talk about it. My mind is racing right now...it's almost 2 am and I just couldn't go to sleep once I've finished the book. I apologize for the stream of consciousness type of writing, but it's the best I can do at this hour. Yates with his book reminds me very much of Salinger and his " Catcher in the Rye". It's not like their style of writing is the same, it's more of the feeling it gives you when you read the lines. It's a strange kind of feeling, one that I can compare with being sick to your stomach with its honesty(and I certainly don't mean this in a bad way), shed pitiful tears for the unagreeable main characters or simply fill with compassion at the same time. Like you've just learned a dreadful dirty secret. You KNOW! There are 2 other books from the many many more I've read that have ever left me with this feeling. Feeling that I would burst with emotion, that I am going to be sick with it's brutality and that I love it at the same time. It's almost unbearable and at the same time it's unthinkable that you might not be touched by it. I think now it's time to stop, before I'm half asleep. Read the book and let me know what YOU think!.